This near one-on-one A-Class surfacing instruction covers surfacing electronic products and ergonomic forms using higher surface continuity. Learn to manage light reflections with respect to industrially designed products. This course was designed for engineers working with designers and industrial designers who want to push their skills. Based upon student interests or job requirements. Our SolidWorks Introduction to Surfacing course or serious hours surfacing using SolidWorks. 3D Curves and 2D curves with continuity. Review bounding box curves for controlling part designs. Learn to design in the light reflection with examples zebra & curvature evaluation techniques. Use composite curves for surfacing. Split lines for building surface geometry. Surface Loft and surface boundary functions. Rhino or Alias Studio IGES and STEP imports. Extend Surfaces, Surface Trims, and Knits. Manage Draft using various complex Sweep surfaces. Learn to create special tool curves and surfaces that will help manage surface geometry. Sketch spine curve on surface. Learn to design in the light reflection. Learn to generate more complex geometry utilizing specific workflow. 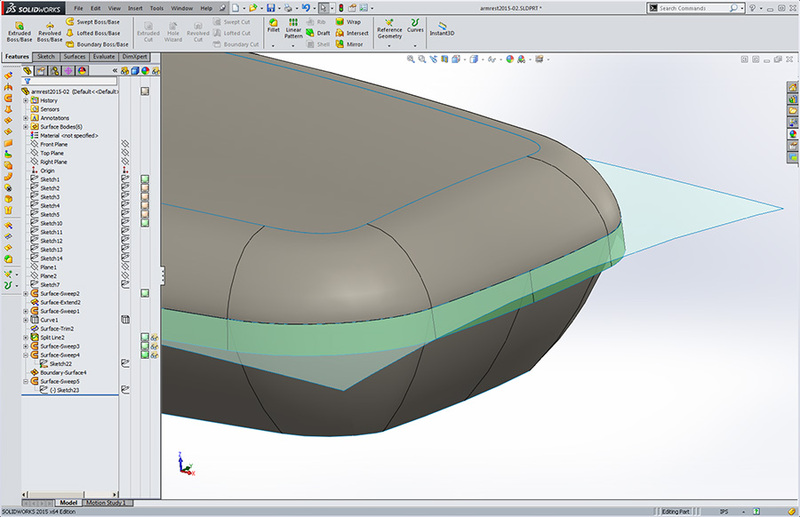 Discuss Mid-Surfaces as a technique used with top down design along with several top down design techniques available in SolidWorks. 3 part boundary modeling techniques followed by using filled surface to resolve 3 part boundaries. Learn to use Curvature surfaces appropriately. Pros and cons of using composite curves. Discuss techniques with respect to bringing in 2D and 3D IGES geometry. Discuss modeling techniques used in Alias Studio or Rhino geometry that we can use in SolidWorks surfacing. Overbuild with respect to tools and functions inside SolidWorks. Discuss plan of attack and modern day surfacing technique. Manage over molding with respect to tools we learned in the class. Utilize free-form to accomplish the same form without an internal curve structure. Discuss using curve tools to manage light reflections. Discuss G1 and G2 & approaching G3 continuity and light reflection with respect to product design and SolidWorks surfacing. Go over in some detail the Math 3d programmers use to program tools like Solidworks then relate that calculus to light reflections and continuity such as G2 and G3 connections. Discuss workflow with respect to capturing form (building a surface model from looking at a foam model). Discuss proving form by taking advantage of parent child relationships and maximizing equations in sketches. Discuss top down design using SolidWorks surfacing examples.